The last post in this series talked about using Power View to analyze the data stored in the SQL Server’s default trace. 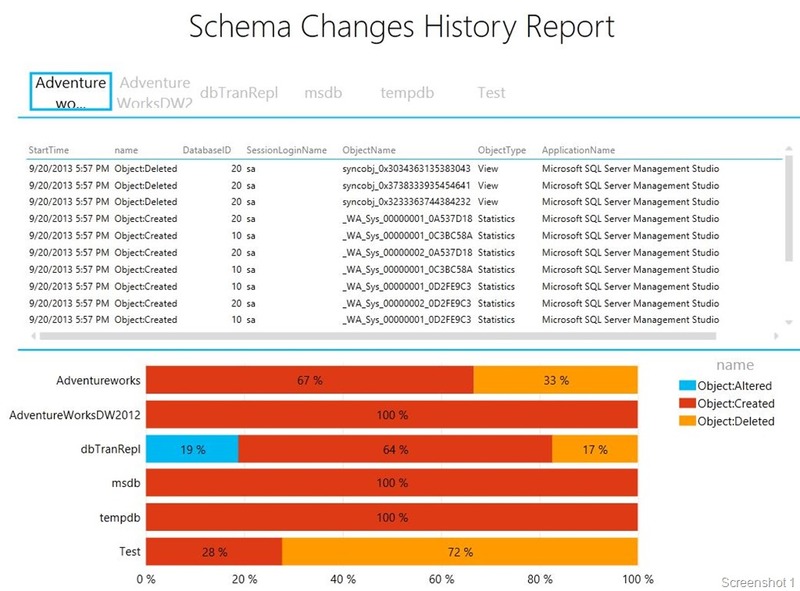 I decided to take this a step further by creating the Schema Changes History report with the help of the data that I retrieved from the Default Traces. The advantage of a report created in Power View is that the interactivity which is missing in the standard report is available. The way I created this report was to filter the data in the Power Pivot table using EventClass ID 46, 47 and 164 for only looking at the create, drop and alter commands which the default trace tracks. After that I created a table with a tile on the Database Name and a 100% Stacked Bar Chart to show the activity at a database level. I also had to create linked tables for getting the Object Type and the Event Class Name that you see in the table below. I will provide a final version of the Excel sheet once I have completed the other dashboards and sanitized the information available in the Power Pivot table. This entry was posted in Excel, Monitoring, Power View, Power View, PowerPivot and tagged Default Trace, Power Pivot, Power View, Profiler Trace. Bookmark the permalink. Have you managed to do this yet? I’d be very interested in it. Yes, I did. The Default Trace Excel file is available at https://onedrive.live.com/?id=92FE07CB41BBD3DA%21123&cid=92FE07CB41BBD3DA . Do let me know your feedback on the same.